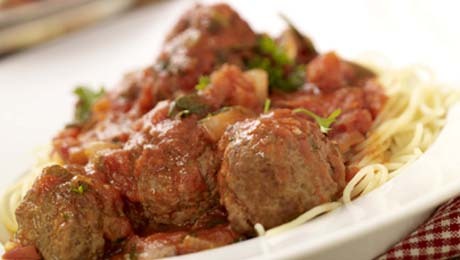 If you want a change from spaghetti, try serving these meatballs in tomato sauce on top of a large baked potato. Begin by heating a large deep sauté pan with half a tablespoon of oil. Place the meatballs onto the pan and seal lightly on both sides until they are all browned off. Once the meatballs are browned off, you can add the sliced onions, mushrooms and garlic and cook gently over a low heat until softened. Now pour in the chopped tomatoes and allow these to come to the boil with the meatballs. Mix well and continue to simmer gently for another 20 minutes until the meatballs are cooked through. Mix in the fresh chopped parsley just before serving. Serve in pasta bowls if you have them, a generous helping of meatballs and sauce on a bed of spaghetti. This was nice meal though I am unsure if I would cook it again the sauce is quite plain perhaps you could use a jar of dolmio instead I suppose this defeats home cooked effort but it was eaten.